Most of us had different plans for this time of year and related to November as the cozy month in-between the dampness of autumn and coldness of winter. Well, the freezing temperatures are here early and it is that time of year: Parka time. “Oh, but we are not in winter yet! We need another month!” some might argue. The problem is, though, when we say freezing temperatures, we are not exaggerating! 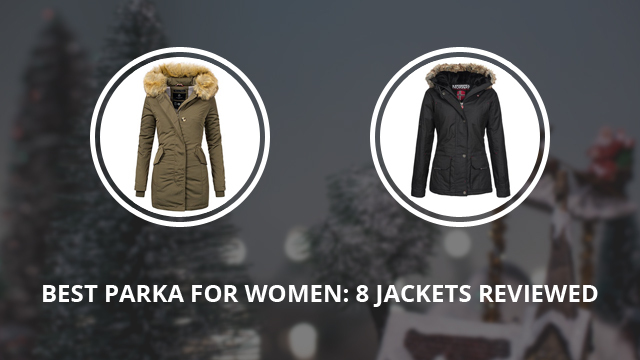 In this article, we will be reviewing eight different parka jackets for women from the best we could find. Because we like to keep it stylish over here, rest assured that we have taken their look and design into consideration. You’ll see! Another great thing about these parkas, apart from how good they look, is their material and cut. They are designed to be lightweight and resemble a typical winter jacket, while having all the features of a quality parka. There will be options with and without the fur trim around the hood, as well as both long and short jackets. The style is mostly casual, but also classy of course, so you will be able to choose a parka that can be worn both daily, or with formal outfits as well. As for brands, you will most likely recognize them, as several are recurring brands in our reviews. Time to take a look at the selection! Atlas is the first parka to be reviewed and is by Geographical Norway, the renowned brand for its winter clothing. 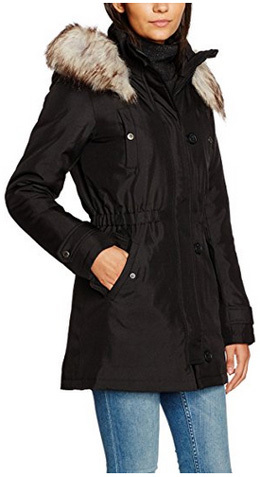 This is a hip-length jacket that goes well with casual outfits and comes in the color Black. The material is 100% Polyester, with the inside lined with warm and soft fleece, which is really breathable. It is a water-resistant jacket, highly insulated and windproof. This is especially helpful for those living in windy areas, which are no light matter during cold winter days. The main zipper is waterproof and covered by a snap button placket which works as wind stopper. On the high, stand-up collar, there is an oversized hood, lined with thick, soft fleece on the inside and decorated with faux fur trim, which also helps in protecting the face against drafts of wind. The pockets are all oversized and with waterproof zippers. There are two flap pockets to the front, two zipper pockets on the sides, one on the right sleeve and three on the inside. To adjust the jacket to size, there are bungee cords on the hood, waist and bottom hem. This next parka is by Berydale, a recently featured brand in our reviews. They make different clothing, for different seasons and are mainly focused towards more sportive designs, with high functionality, apart from comfort. The material is 100% Polyester and with a water column of 5000 mm, making this jacket waterproof. It is a windproof jacket, too, as well as highly breathable. It comes with thumbholes on the inner cuffs, to protect the hands, as well as make the sleeves fit more comfortably while moving around. The outer cuffs are decorated with snap button flaps. It is a long jacket, going below the hips. 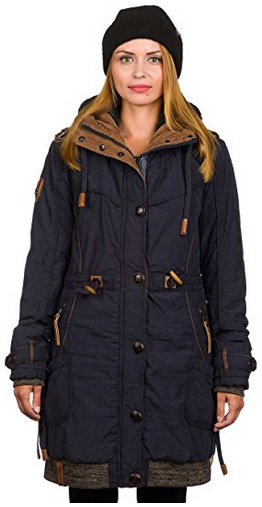 The hood is attached to the high collar, not lined with fur trim, which is not an issue when it comes to cold winds as the collar is quite high and the hood fits tightly around the head. There are several pockets, which offer a lot of storage space. There are two flap pockets on the sides, one zipper pocket above the right flap one, a chest pocket and inner pockets, too. The main zipper is covered and there are drawstrings on the inside of the jacket for adjustment. It comes in five different colors: Black, Grey, Light grey, Brown and Navy blue. DESIRES‘ parka, Annabelle is an eye-catcher. 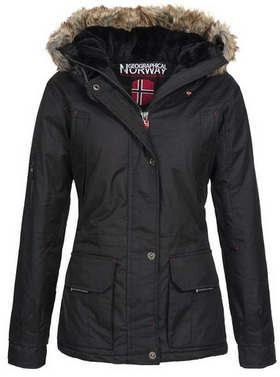 With an elegant look and well-thought detailing, this parka is a must-have. The outer material is a combination of 65% Polyester and 35% Cotton, water-resistant and windproof. The inner material is 100% Polyester, in the form of fleece, which lines the jacket and provides warmth, as well as insulation. There are two oversized flap pockets to the front, two zipper pockets on the sides, two side breast pockets and one inner pocket. It comes with drawstrings on the hood, which is removable, around the waist and bottom hem. Since we mentioned the hem, this is a high-low cut style jacket, with the back being longer than the front and with rounded hem. As for the cuffs, the inner ones are ribbed and elastic, while the outer ones are adjustable with Velcro. The main zipper is covered by a buttoned placket. There are buttons on the pockets and drawstrings as well, which apart from function, add to the look of the jacket, too. The color selection includes: Insignia blue, Dark grey, Ivy green, Cinnamon and Black. This Marikoo long parka is called Karmaa and looks absolutely fabulous. It comes with faux fur trim around the hood, which is thick, soft and looks quite realistic. The material is 100% Polyester, including the padding. The jacket is quilted on the inside, which insulates it fully and provides plenty of warmth. This is a slim fit jacket, with waist cut and goes great with any outfit, despite if it’s casual or formal. The inner cuffs are made of soft, ribbed material, while the outer ones fit loosely over them. There are two hand-warmer pockets on the sides, lined with fleece and a chest pocket on the inside. The main zipper is another detail on this parka, as it closes vertically hip to waist and then goes slightly diagonal. It is covered by button placket. This parka is thicker than the previous ones, but lightweight nonetheless. As for the color options, there are three: Red, Beige and Green. 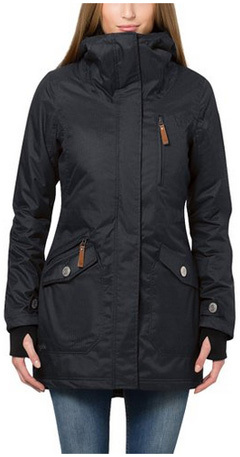 Casual and comfortable, this parka is by ONLY, a Danish brand, and it is made of 100% Polyester in and out. It is a really lightweight jacket that will surprise you by how warm it remains, despite feeling as if you were wearing a light autumn coat. It is a slim fit, with drawstring at the waist and high, stand-up collar, with an attached hood. The hood is lined with faux fur trim, which is thick and fluffy. 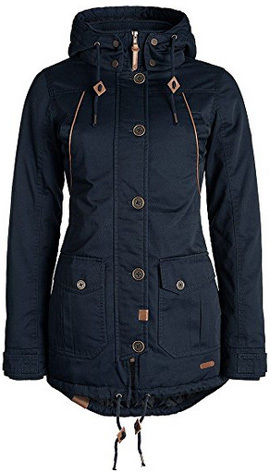 This is a long parka, with a waterproof main zipper, covered by a placket that closes with loops and buttons. There are two side pockets, with snap button flaps and two vertical chest pockets. The cuffs fit loosely around the wrists and are decorated with snap button flaps. There are six colors available: Cloud dancer, Jet set, Samba, Black, Night sky and Fudge. 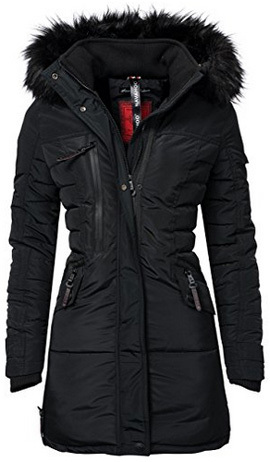 Navahoo‘s Eliya parka is a fluffy and soft quilted jacket, with beautiful black faux fur trim on the hood. 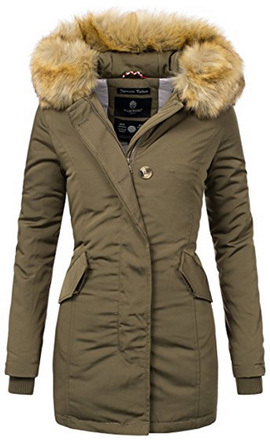 This is a long parka, with drawstring around the waist, and slim cut, to highlight your form. It is made of 100% Polyester, including the padding. The pockets are lined to quickly warm up the hands and they are placed on the sides, chest and one on the inside, with earphone duct, so you can listen to your favorite music, without running the risk of getting your phone or MP3 player damaged by rain or snow. This jacket is waterproof, windproof, and despite its thickness, quite breathable, so you will not overheat or sweat excessively while moving around. The faux fur trim and hood are both detachable, with the hood placed behind the high, stand-up collar. The main zipper is covered and waterproof, as are the pocket zippers. It comes with inner ribbed cuffs and chin protection on the zipper. There are two colors to choose from: Green and Black. The Becky Pupst IV parka by Naketano will give your outfit a carefree look, while keeping you warm and cozy at the same time. It comes in one of the most interesting designs out there, with its baggy pockets and detailing. This jacket is made of 54% Cotton and 48% Nylon on the outside, lined with 100% Polyester, in the form of thick and soft fleece, on the inside. It is a loose fit, adjustable by drawstrings around the waist and has an attached hood and high collar. The main zipper is covered by a placket with large buttons and the adjusting drawstrings on the hood, waist and pockets have wooden and faux leather detailing. The pockets are several, with the outer ones being placed on the sides, two at the thighs and two higher, at the hips with zippers. The hem and inner cuffs are made of soft fleece. This jacket also has shoulder flaps. There are five color options: Blue grey, Black, Dark green, Dark blue and Sand. Coleen brings us at the end of this selection, a long and elegant parka by Brandit. It comes in two different colors: Olive and Black, both classic jacket colors, easy to combine with most outfits. The shell is made of 79% Cotton and 21% Polyester, whereas the inner lining is made of 100% Polyester and is quilted. This jacket has plenty of storage space with its oversized pockets, placed four on the sides and two on the chest. The hem is a high-low design, while the waist is adjustable with drawstrings for proper fitting. The hood is attached, and at the front of the collar, the placket closes with wooden buttons. This is a water-resistant jacket, with high insulation and breathable. The inner cuffs are ribbed and elastic, while the outer ones are folded upwards with wooden buttons that give a modern look to the design.